It seems there are more Indian restaurants than corner stores these days. I'm certainly not complaining (although I do feel for the poor old corner stores!) as Indian cuisine is music to my tastebuds and ever vegetarian friendly. Occasionally we dine in at Indian restaurants but Sunday night is takeout night in our house, and more often than not we eat Indian -so this review speaks not to the restaurants themselves, but rather to the spectacular food they produce, which is afterall, surely the most important element. After living in various areas and sampling a host of suburban Indian restaurants, the following have earnt a place in both my heart and my Top 3. I've never dined in at this inconspicuous restaurant (the decor and ambience leave much to be desired) but whenever I go in to pick up our order I am struck by the fact that it is always frequented by Indians; an indication that speaks to me of quality and authenticity. And the food mirrors that sentiment, never disappointing. This is quality Indian food with a richness and depth of flavour absent from many other restaurants. 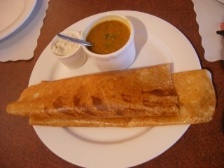 Thankfully for me, the menu is particularly vegetarian friendly, with a separate vegetarian entree and mains menu (the Paneer Makhani is to die for), plus a selection of vegetarian dosais - those light, crispy and delicious pancakes indigenous to southern India. My carnivorous friends assure me the meat dishes are just as tasty, the meat tender and juicy, the dishes packed full of flavour. Southern Spice also has hands down some of the tastiest entrees in town - the Onion Pakora and Medhu Vadai (deep fried lentil doughnut) are both heaven on a plate at $6.50 each - I did say tasty, not healthy! They do cheap lunch takeaway specials Wednesday - Friday, a Sunday Buffet and home deliver to the local area. Restaurants come and go but Taj Bengal has stood the test of time and deservedly so. Opened in 1999, it has since garnered accolades and a steady, regular clientele - a testament to the outstanding nature of their food. Taj Bengal was recommended to me by friends; friends who now live on the other side of town but regularly make the 45 minute round trip to experience the pleasures of Taj Bengal. I've only eaten here (takeaway) a few times but the memory has stuck with me. The restaurant is very simply but authentically decorated and both the dine in and take away menus are extensive. Specialty of the house is Tandoori and they claim to be famous for their Butter Chicken and Lamb Khorma (my friend attests to the validity of this claim), both priced at $9.90 small or $15.20 large takeaway. Vegetarian wise it's hard to go past the Kashmiri Kofta Curry ($13.90 takeaway) which is spicy balls of potato and cottage cheese in a rich tomato, spice and ground almond gravy - yum!! My inclusion of this iconic West End restaurant may be a cause of consternation for some, but Punjabi Palace has long been a favourite of mine and to each their own I say. I've dined in many a time (when busy it is very loud and the service can be a little thinly stretched) and taken away more times than I can count. The menu is huge and I have sampled every vegetarian dish on it, but I always come back to the same two - the inimitable Palak Paneer (spinach gravy and homemade cubes of paneer cheese) and Butter Matar Paneer (paneer cheese and peas in a tomato, cashew and spice gravy), both $12.95 takeaway. Sadly, both dishes are short on actual vegetables but they lack for nothing when it comes to flavour. The rich and creamy Butter Matar Paneer in particular is dreamy, as is that first bite of a Punjabi Naan (bread stuffed with spinach and cheese, $4.20). Beware of the consequences of gorging - Punjabi dishes are quite rich and I've often done myself a mischief by over eating! 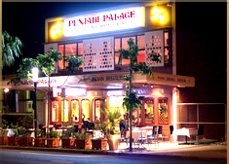 Punjabi Palace is BYO and fully licensed, features a private upstairs function room, has a catering service and home delivers. And there ends my Top 3 - naturally I haven't had the opportunity to sample every single Indian restaurant around, but am always keen to try something new so would love to hear suggestions and recommendations from our readers. I took on board one of my reader's suggestions and recently tried Curryville at Morningside - AMAZING!!! Super fresh, tasty and unique, can't wait to go back. We also love Indian and have collected favourites from around Australia. I can't wait to try your recommendations but can add another brilliant Indian with rich clean fragrant flavours - Ghazal Indian on Gympie Road at Aspley. Its 'newish' owners are a truely lovely family and we drive 40 minutes return to savor their food. A tiny simple restaurant but is actually nice eat-in too as the owners and their kids are lovely. They do a good $20 all you can eat one night too. Great to have a good local business serving up awesome food!! Curry connection, St Lucia to experience more South Indian flavours. try ruby's chillies of india on racecourse road and ruby's cafe and indian restaurant at Mt gravatt and you can feel the real taste of india and their dishes. they have lot of dishes that i think you would never heard off in Australia. Southern Spice at Mt Gravatt is only good for people who like their food very hot. I was unimpressed at paying for meals we could not eat. We explained at ordering we did not like hot food. Even Butter Chicken was inedible. I lived in India for 2 years and am pretty fussy about my Indian restaurants, as is my husband (who cooks amazing indian food at home - lucky me). We have tried many and varied Indian places in Brisbane and unfortunately whilst many of them are okay, not many of them are amazingly memorable. We were long-term customers at Raj Palace when it was in Taringa, but they just disappeared literally overnight and broke our hearts. But we continued our search and for us our favourites to which we return constantly are: Halim's Indian Raj at Rosalie (truly Indian style Butter Chicken as opposed to what most people think butter chicken should be); One Night in India in Toowong can be a bit hit and miss, but when it's "hit" it's very good; Sitar at West End (but only the one in West End, the others we have tried are just not as good); Sherazade in Kenmore (amazing Goan Fish curry); Shanti on Monier Road at Darra; and last, but not least, the newly discovered (for us) Mahendra's at Acacia Ridge. I am sorry you wont know what indian food taste like until you have eaten Perez food at Curryville. British love it as do Australians. Wynnum Road Morningside. Spicy Killer Paneer, Chicken Chaat are the most amazing starters. Vindaloo is spiced up to your taste. Butter chicken is dreamy. Real Breast Chicken! My top brisbane Indian Restaurant would be A Night in India at Toowong, delicious food, nice decor and good prices. The butter chicken is amazing!!! MughalsPalace 1407 Logan Road,Mt. Gravatt is the most fantastic Indian food- really worth a try, especially the Fish curry yum! Aamaya India Restaurant's is also brisbane's top indian restaurant. 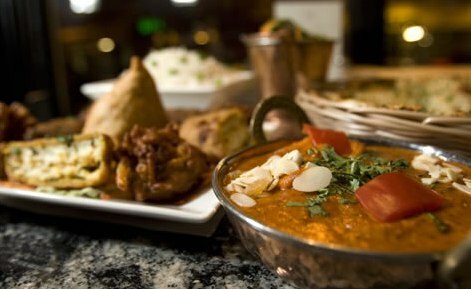 It's menu is blend of contemporary and traditional Indian cuisine that showcases centuries of Indian food history.